Used in many homes from the mid-1960s through the early 1970s, aluminum wiring is a potential fire hazard. If your home was constructed using this type of wiring, Lightfoot Mechanical can upgrade you to copper wiring, which is significantly less dangerous. Let Lightfoot Mechanical help with aluminum wiring repair and replacement in Fort Worth and the surrounding areas, please contact us today. According to the U.S. Consumer Product Safety Commission, aluminum wiring has caused numerous fires, some of which have resulted in serious injury and death. Overheating may occur at the connections between wiring and devices due to expansion. It may also occur at splices. Research indicates that homes wired using aluminum wiring prior to 1972 are 55 times more likely to have at least one connection reach “Fire Hazard Conditions” than homes with copper wiring. Aluminum wiring is still used for certain applications, like single-purpose high-amperage circuits and residential service entrance wiring. However, some post-1972 aluminum wiring may still be problematic. If you have aluminum wiring in your home or you are not sure what type of wiring you have, we recommend scheduling an electrical inspection. When you contact us, we will carefully inspect your entire system and let you know if we find any potentially dangerous wiring. If necessary, we will recommend upgrading you from aluminum to copper wiring to make your home safer. 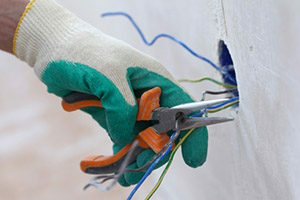 Aluminum wiring replacement in Fort Worth is a big job, and it is one that should always be left to the professionals. Working with electricity is extremely dangerous if you do not have the proper training and equipment. A highly trained electrician in Fort Worth is equipped to handle any rewiring project safely and efficiently. If you have aluminum wiring in Fort Worth, please contact Lightfoot Mechanical today.